Say thanks to the wedding guests for their attendance, wishes and gifts with some delicate wedding thank you cards. You can buy some cards from stores or make it with our card maker FotoJet. 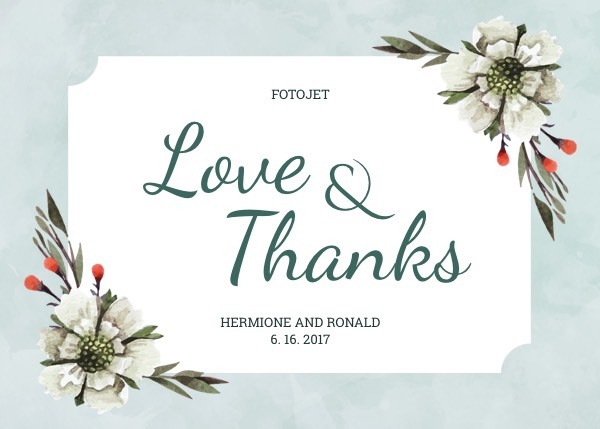 Beautiful floral illustrations, stylish text and background colors make this wedding thank you card template a harmonious whole. It is an easy way to represent your creative ideas! Don’t be scared to make some changes with editing tools. You have full control over images, text and more. Try it now to make some cards to send your love and thanks to everyone who attended your big day!